It hasn't even been a year, and I'm re-creating a dish I dreamed up in a sort of inspired daze last July. Only this time it came out different, and wouldn't you expect that? It is the epitome of a vegetarian meal: Pea tacos. Ewww, that sounds so gross. But look. 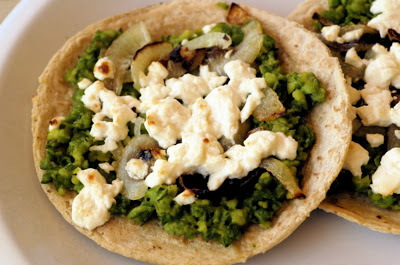 The dreamy mash of cooked peas mixed with peppery olive oil atop corn tortillas, crowned with feta cheese and sautéed sweet onions. A minute under the broiler. You can't beat this for nutritional value and sheer yumminess. Plus, I'm still stuffed. Please forgive my cheese sandwich post for the day. I only have problems forgiving you for not sharing this delizia with me, nothing else. Peas as in English peas? Do you grow them? This sounds intriguing. Sounds really good. Anything with feta and I am so there! Ilva! I thought of you as I ate this. It reminded me of my discovery, when reading the Silver Spoon cookbook, that unexpected (and frankly, unexciting) combinations can be so rewarding. Cyndi: Yes, as in English peas. I *was* planning on trying to grow some, but I didn't get to it in time. We have a very prolific local supplier, though. Jenndz: Feta is a secret ingredient, much like garlic. If you use them, it tastes like food! I also love feta and these look great. Peas always add such a beautiful colour to a dish! For lunch today I had sprinkled feta on mushrooms and baked it for 20 minutes. Does that count as a cheese sandwich? The Brown-Mice are having this for Dinner tomorrow night - bought the corn tortillas this afternoon -mmmm. nice use of the word rePEAting. Holler: Sort of like a guacamole-hummus... but not. DMM: I'm thrilled to hear you were inspired. I'll drop by to see how you liked them. Sam: Somehow that pun must have been banging around in my cranium, but I missed it. Wish I had used the capital letters. You are so clever. So delicious! I caught up with all your posts after coming back from a long vacation a few days ago, and finally made time to write a few comments. I think pea tacos are a fabulous concept, so innovative that it is worth repeating for multiple dinners! I am celebrating pea taco season and mayonnaise season now! PE: Hi! Yeah, 'tis the season. Lap it up while you can. So glad this odd concoction was an inspiration to you.